Download Eye in the Sky in Digital HD from the iTunes store. Eye in the Sky images are © Entertainment One. All Rights Reserved. War is a polarizing subject. Is it necessary? Do the ends justify the means? For hundreds of years, countries have sent their young adults off to kill or be killed with mixed results. With today's technological advances, the risks of casualties may seem smaller but can actually be just the opposite. 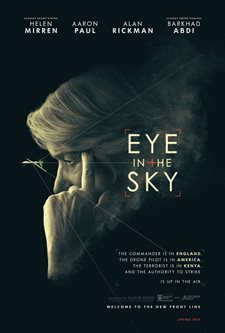 Gavin Hood's (Ender's Game) Eye in the Sky explores these and other themes in a gripping, 2 hour suspense filled movie. Colonel Katherine Powell (Helen Mirren; Woman in Gold) has been tracking some of the most wanted terrorists for years. When intelligence data places them in Kenya, the British, American and Kenyan military decide it is time to capture them to stand trial. However, when they don't show up to the meeting place and instead are holed up in a house in Somalia, the mission changes from capture and interrogate to eliminate. Suddenly, drone pilot Steve Watts (Aaron Paul; Breaking Bad) goes from everyday surveillance to the trigger man for the kill shot. He struggles with this new role while the British and American governments grapple with the ethical dilemma of how much collateral damage is too much – a discussion that is further complicated by the sudden presence of a young Somalian girl selling bread in the strike zone. As the military race against time, the debate heats up as to saving an innocent life over the greater good of possibly averting a terrorist attack that could kill hundreds of innocent people. There is so much right about this film it's difficult to find many flaws. Mirren is fabulous (as usual) as the tough as nails Colonel bent on not letting this opportunity slip away, while Paul struggles with his emotions as he does some soul searching regarding saving a little girl's life over following orders. In his last live action appearance, Alan Rickman (Die Hard) as Lt. General Frank Benson reminds us of what a lost talent his passing has created. His lines, delivered brilliantly, roll off his tongue as smooth as silk caressing a warm body. The intensity of this movie is one of its finest qualities, making you sit on the edge of your seat the entire time. Hood's bird's eye view of the bright Somalia desert juxtaposed with the dark, dingy, and ominous surroundings of Powell's command post lends itself to the good versus evil debate, though I'm not exactly sure which side is the good one, or if there is one side that is truly right. And that may be one of the beautifully poetic ideals of this film. Is there really always a right and wrong, especially where war is concerned? At the very least, this movie should spark a dialogue about collateral damage, the impact of war and, as evidenced at the end of the film, what damage war and combat have on those fighting it on the front lines. It also should make us ask important questions about drone warfare. Hood brings, what I think, is a very realistic view of the state of military affairs and diplomatic relations to the screen. His depiction is artful and emotionally charged and is an excellent film overall.